Please note CARTA service could be impacted well before landfall. If you rely on the system for transportation, please make preparations, such as trips to the store, now. Information will be made available here on an on ongoing basis. Check back regularly for updates regarding CARTA service. NORTH CHARLESTON, S.C. (SEPT. 15, 2018) – In the aftermath of Hurricane Florence, CARTA will resume regularly scheduled service beginning Sunday, Sept. 16. Riders can sign up for push alerts by downloading the Transit App on Apple or Android devices and selecting the routes for which they would like updates. The latest CARTA news is available at RideCARTA.com and on CARTA social media channels, @ridecarta on Facebook, Twitter and Instagram. Information regarding a return to regular service will be made available later today on our social media channels and at www.rideCARTA.com. Sign up for push alerts by downloading the Transit App for Apple or Android devices and selecting the routes for which you would like updates. NORTH CHARLESTON, S.C. (SEPT. 12, 2018) – CARTA will suspend all operations at 9 p.m. on Wednesday, Sept. 12. Limited emergency evacuation services will resume on Thursday, Sept. 13, at Charleston County’s direction. CARTA will operate an emergency circulator on the Charleston Peninsula throughout the day Wednesday. The 14-stop circulator, which can be viewed here, will offer pick-up hourly. The emergency circulator will run in addition to regular service until 9 p.m. on Wednesday. Riders on the emergency circulator will be taken to the Charleston County Public Service Building. The county will provide transportation to regional emergency shelters based on occupancy. All riders are encouraged to call the Charleston County Emergency Public Information Line at (843) 746-3900 with any questions. Transport those with mobility impairments (disabilities) to an appropriate shelter. Transport individuals with pets who would like to evacuate to a pet-friendly shelter. Contact the Charleston County Emergency Public Information Line at (843) 746-3900 and a vehicle will be dispatched to transport disabled residents and those with pets to directly to pet- and special needs-friendly evacuation shelters. A map of the emergency route operated by CARTA and the pick-up points can be viewed at here. CC-101: Bus stop at Meeting Street and Mary Street. CC-102: Bus stop at Meeting Street and Johnson Street. CC-103: Bus stop at Fishburne Street and Rutledge Avenue. CC-104: Bus stop at King Street and Mt. Pleasant Street. CC-105: Bus stop at Calhoun Street and Alexander Street. CC-106: Bus stop at Beaufain Street and Market St. (Canterbury House). CC-107: Bridgeview Village Apartments – 106 D. North Romney Street. CC-108: Bus stop at Doscher Avenue and Peonie Street. CC-109: Bus stop at Rutledge Avenue and Gordon Street. CC-110: Bus stop at Rutledge Avenue and Cannon Street. CC-111: Bus stop at Rutledge Avenue and Bennett Street. CC-112: Bus stop at Broad Street and Logan Street. CC-113: Bus stop at East Bay Street and Hassel Street. CC-114: Bus stop at Morrison Drive and Romney Street. The latest Hurricane Florence CARTA-related news can be found at ridecarta.com/Florence. Information will also be available on CARTA social media channels, @ridecarta on Facebook, Twitter and Instagram. NORTH CHARLESTON, S.C. (SEPT. 11, 2018) – CARTA will end emergency services at 6 p.m. on Tuesday, Sept. 11, and resume operating an emergency circulator on the Charleston Peninsula beginning at 8 a.m. on Wednesday, Sept. 12. The 14-stop circulator, which can be viewed here, will offer pick-up hourly. Regular operations, except Route 203 Medical Shuttle, will continue into Wednesday, as conditions permit. The emergency circulator will run in addition to regular service until 6 p.m. on Wednesday, or until conditions become unsafe. Regular service will be available until conditions become unsafe. Riders on the emergency circulator will be taken to the Charleston County Public Service Building. The county will provide transportation to regional emergency shelters based on occupancy. All riders are encouraged to call the Charleston County Emergency Public Information Line at (843) 746-3900 with any questions. Contact the Charleston County Emergency Public Information Line at (843) 746-3900 and a vehicle will be dispatched to transport disabled residents and those with pets directly to pet- and special needs-friendly evacuation shelters. NORTH CHARLESTON, S.C. (SEPT. 10, 2018) – CARTA will begin operating an emergency circulator on the Charleston Peninsula beginning at noon on Tuesday, Sept. 11. The 14-stop circulator, which can be viewed here, will offer pick-up hourly. All riders are encouraged to call the Charleston County Emergency Public Information Line at (843) 746-3900 with any questions. The emergency circulator will run in addition to regular service all day Tuesday. CARTA anticipates operating at full capacity into Wednesday or until conditions become unsafe. Riders on the emergency circulator will be taken to the Charleston County Public Service Building. The county will provide transportation to regional emergency shelters based on occupancy. You have questions or need to make a request regarding transportation. You need transportation to the nearest shelter during a voluntary or mandatory evacuation. You are disabled and cannot get to the nearest evacuation pick up point. If a mandatory evacuation has been called for, expect CARTA services to be suspended within 24-48 hours in order to assist with evacuation efforts. This could happen with very little warning. As conditions deteriorate, all CARTA vehicles will be removed from the road within 24-48 hours of expected landfall. Please plan accordingly and make any trips to purchase supplies in advance of an evacuation order or as quickly as possible once the evacuation has been called for. If an evacuation is ordered and you do not have transportation in Charleston County, buses will be provided to take you from assigned pick-up points to the Charleston County Public Services Building and then to the nearest available shelter out of the area. Look for blue Hurricane Evacuation Bus Stop signs designating a pick-up point location near you. CARTA will begin operating an emergency circulator on the Charleston Peninsula beginning at noon on Tuesday, Sept. 11. The 14-stop circulator, which can be viewed here, will offer pick-up hourly. All riders are encouraged to call the Charleston County Emergency Public Information Line at (843) 746-3900 with any questions. Be aware that the buses sent will most likely be yellow school buses, not CARTA buses. For a list of the pick-up points please visit charlestoncounty.org. To transport those with mobility impairments (disabilities) to an appropriate shelter. To transport individuals with pets who would like to evacuate to a pet-friendly shelter. If you have an animal to bring with you while evacuating and do not have transportation, contact the Charleston County Emergency Public Information Line at (843) 746-3900 and a vehicle will be dispatched to transport you and your pet(s) to a pet friendly evacuation shelter. 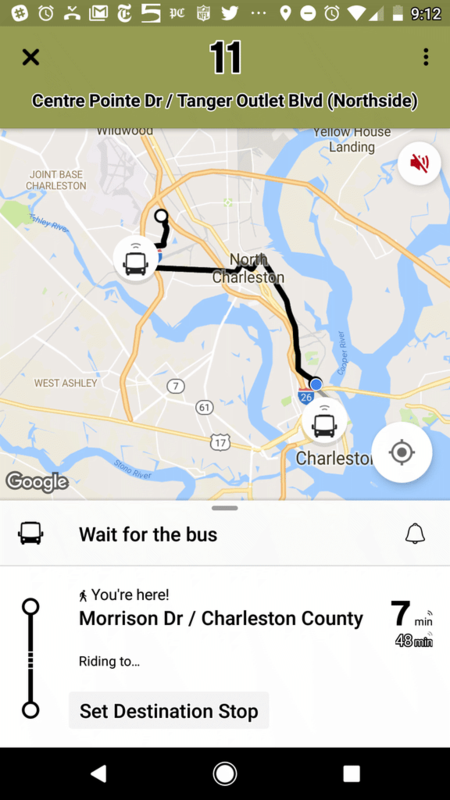 CARTA also runs an on-demand downtown Charleston Peninsula route at the request of Charleston County to assist with picking up individuals from stops with the blue hurricane signs. Once a request has been made, individuals will need to be at the bus stop with blue hurricane evacuation sign in order to be picked up. These stops are often located near a regular CARTA bus stop, but you should become familiar with where your stop is in advance of any emergency. Visit ridecarta.com during the evacuation for more details. CARTA Customer service may not be available at times prior, during and after the storm. Contact the Charleston County Emergency Line at (843) 746-3900 for all transportation needs during an emergency. During an evacuation CARTA service will ONLY take you to the shelter. CARTA emergency service commence following the Governor’s call for an evacuation. The planned route is designed to offer pick-up every 60 minutes. Call the Charleston County Emergency Public Information Line at (843) 746-3900 with any questions. CC-106: Bus stop at Beaufain Street and Market Street (Canterbury House). CARTA will resume regular services on a route-by-route basis as road and weather conditions permit. Visit ridecarta.com for information and updates relating to CARTA services before, during and after the storm. This is a revised listing of the shelters being used for Hurricane Florence in priority of use. Please note that this is the proposed order of shelters that evacuees will be sent to. Download Charleston County’s 2018 Hurricane Guide for information on building an emergency supply kit, preparing your home, evacuation zones routes and other important information. Download current Charleston County hurricane information.